Maybe the Strategic Homeland Intervention, Enforcement, and Logistics Division rigged this one. Despite ratings similar to those that saw Once Upon a Time cancelled, ABC has renewed its Marvel’s Agents of SHIELD TV show for a sixth season of just 13 episodes. 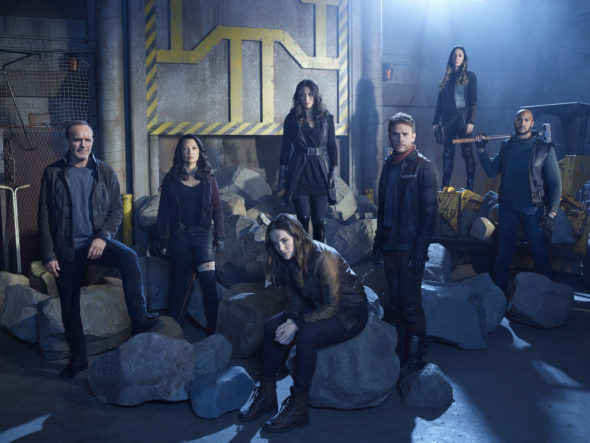 An ABC sci-fi action adventure drama, Marvel’s Agents of SHIELD stars Clark Gregg, Ming-Na Wen, Chloe Bennet, Iain De Caestecker, Elizabeth Henstridge, Henry Simmons, and Natalia Cordova-Buckley. From Joss Whedon, Jed Whedon, and Maurissa Tancharoen, the series is set in the Marvel Cinematic Universe. The fifth season of Marvel’s Agents of SHIELD is averaging a 0.53 rating in the 18-49 demographic and 2.08 million viewers. Compared to season four, that’s down by 28% in the demo and down by 11% in viewers. Find out how Marvel’s Agents of SHIELD stacks up against other ABC TV shows. Word is that the sixth season renewal came down to the wire. While the show is weak in traditional ratings, it does well in DVR viewing and is a strong seller internationally. It also helps to keep the Marvel brand in front of audiences and the network didn’t have any new Marvel shows in development for next season. Marvel’s Inhuman’s was cancelled last week. The network has ordered 13 episodes for a likely mid-season run. It’s unknown if Marvel’s Agents of SHIELD will continue to air on Friday nights or if this will be the final season. What do you think? Are you still watching Marvel’s Agents of SHIELD TV series? Did you think it would ABC would cancel or renew it for season six? Marvel’s Agents of SHIELD on ABC: Cancelled or Renewed for Season Six? Marvel’s Agents of SHIELD: Cancelled or Renewed for Season Five on ABC? I love “Marvel’s Agents of Shield”. I would absolutely hate for the show to be cancelled or have it’s final season! I’m sad to hear it won’t have a full run this season, but 13 episodes is better than none! C’mon ABC DON’T THROW IN THE TOWEL ON AGENTS OF SHIELD!! P L E A S E!! After the last season, there was some loose ends to tie up. Honestly, they have done a great job, in my opinion, making each season tell a different story, while keeping the characters evolving but true to themselves. I’m hoping they will at least utilize Season 6 to wrap up some loose ends and let some “well deserving heros” have a happy ending. Honestly, after last season’s finale, I really thought that it was the end. I hope it’s back next year. Love this show! We need more. Avid fan of the show, I can’t wait to watch the next episodes. I absolutely love Agents of Shield – crazy ending to season 5 felt like it was meant to be the end, I hope the 13 episodes of Season 6 stay as amazing as the rest of the series. So glad it’s being renewed! Not surprised about Inhumans really, Agent Carter was way better and barely made it through season 2. This season was very difficult to follow. However, I did watch every episode. I will continue to watch season 6. I love the show. Please do not cancel.